The 2008 Country Reports on Human Rights Practices has just been published by the U.S. Department of State. The year just ended was characterized by three trends: a growing worldwide demand for greater personal and political freedom, governmental efforts to push back on those freedoms, and further confirmation that human rights flourish best in participatory democracies with vibrant civil societies. This report, like its predecessors, is organized by part of the world and then by country. It "cover[s] internationally recognized individual, civil, political, and worker rights, as set forth in the Universal Declaration of Human Rights." Published since 1979, Country Reports on Human Rights Practices are available in print in the Law Library: JC571 .U48 at Reference Area & Classified Stacks and on the State Department website since 1999. Oral histories of journalist Adele Ferguson and Nirvana bassist (and political activist) Krist Novoselic round out the first release. Look for an oral history of Judge Carolyn Dimmick in March. the arts (Rock Music -- Seattle). It's an amazingly rich resource -- and fun to browse, too! Prize: The first UW law student to write to Reference with a note saying you looked at HistoryLink gets a small prize (we have some nice chocolate bars and other little treats). Update: we have a winner (our first faculty member)! Further update: Never mind: the prof declined the prize. So it's still available! All of the career experts say that it's important to get out there and network. Find lawyers who work in the field you'd like to enter and ask them if they'd give you a little time for an informational interview. Good idea. But some students have said that it's hard to find the lawyers to contact. How can they find who's doing corporate tax in Portland or what public interest groups in New England are working on environmental issues? Don't despair: research can help! Try out our Sample Searches for Networking and Informational Interviews. Care for a chocolate bar or other small prize? Be the first UW law person to write to the Reference Office with the phrase "research is useful" and the prize will be yours. It is clear that change and advancements, both systematic and scientific, are needed in a number of forensic science disciplines to ensure the reliability of work, establish enforceable standards, and promote best practices with consistent application. Chapter 3, The Admission of Forensic Science Evidence in Litigation, will be of great interest to members of the legal community. The report finds that the existing legal regime--including the rules governing the admissibility of forensic evidence, the applicable standards governing appellate review of trial court decisions, the limitations of the adversary process, and judges and lawyers who often lack the scientific expertise necessary to comprehend and evaluate forensic evidence--is inadequate to the task of curing the documented ills of the forensic science disciplines. The Frye standard; Federal Rule of Evidence 702; Daubert; and judicial dispositions of questions relating to DNA evidence, drug identification, fingerprint analysis, and other forensic evidence are discussed. On Wednesday, March 4th, the Law Library will be closed from 3-6:30pm for a faculty scholarship reception. Members of the Gates Hall community may register to attend the event, called Bridging Town & Gown: Legal Challenges in a Global Community. This CLE features presentations by School of Law professors Joel Ngugi, Scott Schumacher, and Veronica Taylor. Registration provides you with a nametag that provides entrance to the Library for the reception following the lectures. During the reception, articles and books published by School of Law faculty will be on display. Now you can Search Harper's Index. Try plugging in "law school" or "seattle" or "legal aid" or, well, anything. It's entertaining and intriguing. And each statistic has a source listed: they don't just make this stuff up! For more sources for statistics, see our guide, Nonlegal Research. Federal Court Records to the Public? The New York Times reports on activists' efforts to make federal court dockets available online free (currently there's a charge of 8 cents a page). An Effort to Upgrade a Court Archive System to Free and Easy - NYTimes.com, Feb. 12, 2009. We are used to searching for legislative history, but what about regulatory history? For most researchers, trying to find answers to questions about the language of a regulation, or the reasons behind a regulation used to be limited to reviewing the "proposed regulation" and the "final regulation" entries printed in the Federal Register. But there were always other documents that might be of interest in the agency's file (its "docket") on the particular rule. These may now be accessed online at regulations.gov. That website contains proposed regulations, final regulations, some agency notices, and some agency docket materials. For instance, if the agency posts its dockets at this website, you may be able to find the comments submitted by the public on a proposed rule. In fact, you will be able to comment yourself online at that website on proposed regulations if the period for comments is still open! For more information about researching administrative law, check out the Gallagher Law Library's U.S. Administrative Law Research guide. by Charles Halpern, CT275.H2584 A3 2008 at Classified Stacks. Amid a national dialogue of change, a leading legal scholar and prominent social activist argues that inner growth through the cultivation of wisdom can bring about a more just, compassionate, and sustainable world. . . . Charles R. Halpern, co-founder of the public policy and advocacy center Demos, describes the evolution of a left-brain, aggressive attorney into an effective social entrepreneur-activist who brings a wisdom perspective to all his relationships. With wit and self-deprecating humor, Halpern shares candid and revealing lessons from every stage of his life, from boyhood to his post-retirement activism, describing the landmarks and guideposts he discovered on his journey and the teachers and colleagues he encountered on the way-a cast of characters that extends from Barney Frank and Ralph Nader to Ram Dass and the Dalai Lama. 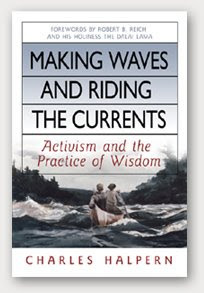 "Making Waves and Riding the Currents" vividly demonstrates the life-enhancing benefits of integrating a commitment to social justice with the cultivation of wisdom. But this captivating memoir is about more than that. It's about the inner work that makes the outer work possible. The first person* to email the Reference Office with the phrase "making waves" wins one of our prizes. SSRN -- the Social Science Research Network -- can be a powerful tool for researchers and for writers in many fields, including law. Writers can post abstracts of papers (and the papers, too, if they want), whether in draft or already published. That helps them reach an audience. For papers that they're still developing, it can help them get valuable feedback. Researchers can search the database of abstracts to find papers. If they register (it's free! ), they can download papers (it's free!). Researchers (or anyone interested in a subject) can also subscribe to subject-based electronic journals that regularly send you new abstracts. You don't have to be a professor to post your papers. Students who want to increase the audience for their law review and journal notes can post. And you can post if you have a paper that's unpublished that you'd like to make accessible. 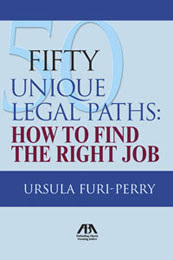 Check out this new book from the ABA: Fifty Unique Legal Paths: How to Find the Right Job, KF297 .F87 2008 at Classified Stacks. One of the best-kept secrets about the law degree is its versatility. Few degrees can match the 600 career tracks that can be followed upon its receipt. Today's world requires increased flexibility, and a law degree can provide diverse career choices and many legal paths that still allow you to impact the lives of countless people through your work. This thorough, easy-to-use handbook focuses on the wide variety of job options for law graduates. In addition to non-practicing legal positions, you'll find the ten booming practice areas for attorneys, as well as some unique positions outside the legal field for which the JD degree is a natural fit--many of which you may have never considered! This is not a book just about non-attorney positions in the law or about shunning the law altogether. From banking to criminal justice, from education to ethics and compliance, the job market is ripe with opportunity for JD's--and this book has them all. Most importantly, the book includes insight and advice from successful attorneys and law graduates who have carved out fulfilling careers while involved in their profession. You'll also discover how each person got their great position (sometimes rather unexpectedly) through a series of career changes and decisions. In addition, the book contains a wealth of resources, online and elsewhere, to help you gather all the facts and put them to work for you. This engaging book will inspire you to set out on a journey of your own towards the career that will prove to be your perfect fit! If you are considering a career in law, if you have your degree and haven't made up your mind, or are considering a career change, this is the perfect book for you! The first UW law student to email the Reference Office with the phrase "find the right job" wins a prize. Today high school students from three schools (Archbishop Murphy in Everett, Meridian in Bellingham, and Port Townsend) are visiting the law school for a mock trial scrimmage, with feedback from UW law students. High school mock trial programs are a great way for teenagers to develop their speaking skills and learn about the legal system. How many of today's law students were on mock trial teams five or ten years ago? I'll be giving the students a little web tour, using this guide. A new guide, Creative Research for Advocacy: Tips for Clinic Students and Others offers some help to students (and others) who have assignments like "Gather social science studies about this problem our clients face" or "Write a brochure to explain this legal issue to the public." The guide was prepared for the Refugee and Immigrant Advocacy Clinic, but the tips should be helpful in many other settings. Westlaw currently offers databases of trial court orders; look for significant trial court opinions to become available soon. In an open letter to the American Judges Association, published in Court Review, a content acqusitions manager from West encourages judges to subject significant rules and noteworthy cases for inclusion in Westlaw's Trial Opinions database. We are primarily interested in publishing opinions and selected orders that contain substantive legal reasoning on important issues for your court, your jurisdiction, or Westlaw customers. In exchange for your willingness to let us know about your significant orders and opinions, we will make the state trial orders database for your state available on Westlaw to you free of charge. 44 Ct. Rev. 107 (2008). UW Affiliate Professor Andy Benjamin has an article in Trial about life balance: G. Andrew H. Benjamin, Reclaim Your Practice Reclaim Your Life, Trial, Dec. 2008, at 30.
either a sufficient advance fee/retainer or the conscious decision to handle cases pro bono. Figuring out how to interpret statutes -- and persuading courts that your interpretation is correct -- is a recurring challenge. 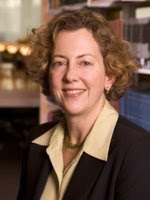 To help Washington legal researchers through this thicket, Prof. Helen Anderson has written Statutory Interpretation in Washington in the Feb. 2009 Washington State Bar News. Prof. Anderson walks you through the framework used by Washington courts -- plain meaning (which the Supreme Court says can include context), common textual canons of construction (e.g., expressio unius, "to express one thing in a statute implies the exclusion of the other"), canons related to context, legislative history, and more. This is a good time to remind you of our guide, The Legislative Process. It includes a section listing resources (both online and print) on statutory interpretation. If you need to roll up your sleeves and do a legislative history of a Washington law, you might want to start with our guide, Washington State Legislative History. Washington Supreme Court briefs (June 2006-date) are now available on the Washington Courts website. You can browse the briefs by case number, by case name, or by hearing date. Or you can search. I tried searching for "confrontation" and pulled up briefs discussing the confrontation clause. The Courts site also has Division II briefs filed since June 2006. Update (Feb. 25): Welcome, that is, to researchers who have been frustrated working with microfiche briefs. Some lawyers, though, are not sure it's such a boon for their work to be available to anyone who wants to cut and paste. Have you ever wondered about law librarianship as a career? I first thought about it when I was a law student and heard one of my school's law librarians speak, but I didn't do anything about it for a long time. Three years out of law school, I talked to several law librarians (informational interviewing!) and then got a temp job in a law library. I was hooked. I wrote an online article about law librarianship back in 1999 after responding to several email inquiries. This last summer I updated the article: Update to Choosing Law Librarianship: Thoughts for People Contemplating a Career Move | LLRX.com. If you want to know more, come talk to us. The UW has a terrific law librarianship program, and the Gallagher Law Library has a lot of good librarians to talk to.